RISMEDIA, February 16, 2011—The Case-Shiller Index is one of the country’s most popular ways of measuring the movement of home prices. And in its latest rating, which went out in late December, the verdict was: Prices are down. The Case-Shiller report’s 20-City Composite rating was 0.8% lower than it was one year previously; the first year-on-year decrease since October 2009. In some markets, sales were the worst ever—as the report noted: “While the composite housing prices are still above their spring 2009 lows, six markets—Atlanta, Charlotte, Miami, Portland (OR), Seattle and Tampa—hit their lowest levels since home prices started to fall in 2006 and 2007, meaning that average home prices in those markets have fallen beyond the recent lows seen in most other markets in the spring of 2009.” This may make buyers complacent, expecting prices to go down further. And if you’re a seller, your immediate reaction might be to hide under the covers. But all may not be so negative—in fact, quite the contrary. For one, Case-Shiller numbers, when they come out, have a lag time of several months—the aforementioned batch covers through October. Since then, a lot of positive things have happened. For one, strong consumer holiday-shopping showings boosted big retailers across the country, making it the best shopping season in years. A rising stock market and tax-cut extension has also made folks a little less nervous to open their wallets. And, while unemployment is still a problem, there is some good jobs news as well—initial jobless claims fell to 388,000 for the week ending Dec. 25, down from 422,000 in the prior week (the first time it’s gone below 400,000 since July 2008). It’s because of reasons like this—increased consumer confidence and slight lessening of fear—that you shouldn’t count on home prices dropping more. Part of it is psychological: If people see the financial and retail markets go up, signaling that the bottom in this particular financial cycle has been reached and things are moving upward, that creates more interest in buying big-ticket items, like homes. It’s normal for a buyer to start rationalizing things this way: If the economy’s starting to improve, this house is going to wind up costing much more at some point. I’d better get in the door now, so I don’t miss the boat. This mentality—of getting in before things move up—is something to think about if you’ve been considering selling. Get your home prepared to sell by having a professional home inspection and fixing major problems that could be impediments to buyer interest. And for buyers: Buying a home is an individual process with many factors at play, so it’s impossible to say that it’s the ideal time for everyone to buy. 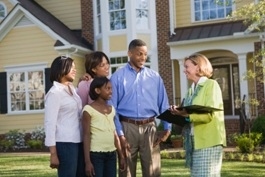 But for many buyers, a simple saying may very well hold true: Get in while the getting’s good.